TCM Vietnam High Dividend Equity is a high dividend equity fund. At least half of the fund capital will be invested in listed shares on the exchanges of Ho Chi Minh City and Hanoi. At the most 20% of the fund can be invested in the Vietnamese OTC market. This depends on the liquidity of this market. The funds investment policy will be aimed at achieving capital growth as well as dividend pay outs. In principle, the fund will pay out dividend once a year with an expected dividend yield of approximately 4% per annum. 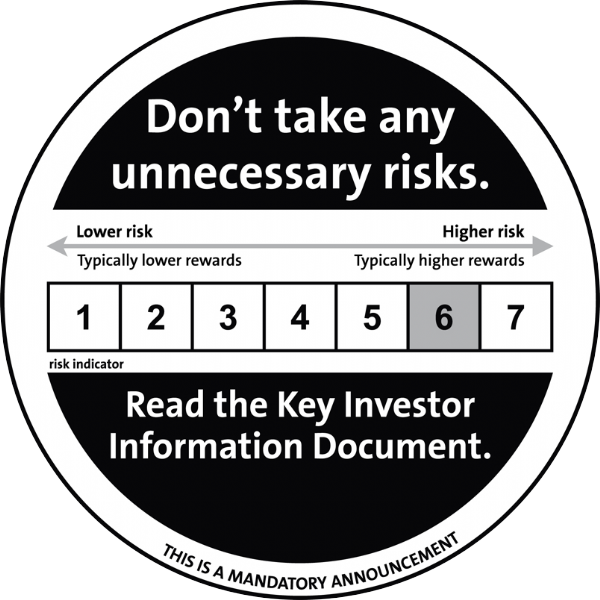 The risk profile is high, due to investments being channelled into frontier markets in Vietnam. The relationship between global financial markets and the Vietnamese markets is low, because the latter are less sensitive to international developments. To achieve its objective, the Fund invests 95% to 100% of its total assets through TCM Investment Funds Luxembourg in units of TCM Vietnam High Dividend Equity (Lux). The Fund qualifies as feeder-structure. 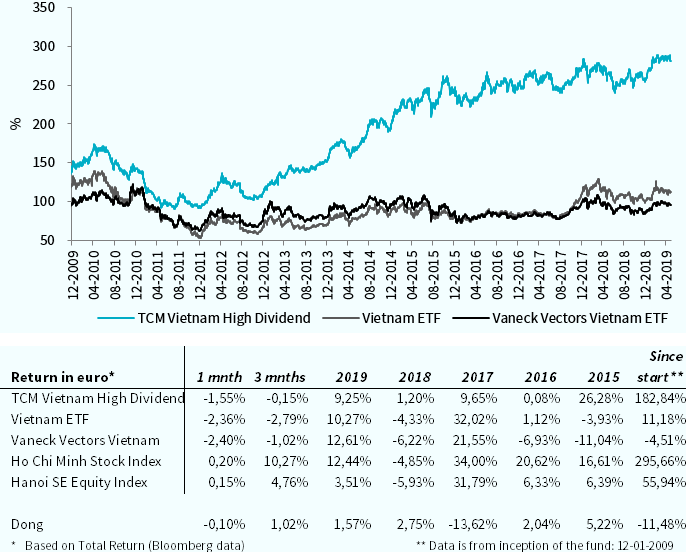 In March the TCM Vietnam High Dividend Fund showed a flat performance compared to the benchmark ETF that rose 0.84%. Basically the underweight in the large real estate companies like Vingroup and Vinhomes was responsible for the underperformance this month. On the other hand FPT Corporation, our third largest holding, showed strong results across the different divisions. It was hopeful to see that the late investments in artificial intelligence and cloud services are currently contributing to the profit. We will remain invested in this core holding. During the month we saw a positive start and a bit more negative trend at the end. Global markets reacted negatively to the inverted yield curve for the US bond market. The idea is that an inverted yield curve is seen as a possible predictor for a recession. Despite this news foreign investors were buyers during the month and local investors were selling stocks on average. We remain positive on the outlook for Vietnam especially in the mid- and small-cap segment where valuations remain attractive. Compared to the Vietnam ETF the TCM Vietnam High Dividend portfolio trades at a P/E discount of more than 50% (20x versus 9.26x). The macro numbers remained positive as GDP growth in the first quarter was reported at 6.8%, this was at the high end of forecasts. Inflation fell 0.21% compared to the previous month, mainly caused by lower food prices. Although we might see some upward pressure on the inflation since the electricity prices will be raised more than 8% in the coming months. Foreign direct investments increased to US$ 10.8 billion, an 86% jump compared to last year. During Q1 a trade surplus of US$ 536 million was realized. The PMI confirmed the positive economic trend, the number increased to 51.9 from 51.2. The fund currently holds 38 positions across a number of sectors. Consumer Staples and Basic Materials are the main themes weighting 18.26% and 17.48% respectively. Within these sectors we currently find the most high dividend stocks which meet our criteria. The weighting on sector level depends mainly on the relative attractiveness of a stock/sector versus other stocks/sectors. The fund allocation can therefore deviate strongly from the Vietnamese benchmark indices. 10% of the outperformance of the benchmark of the Luxembourg Master Fund. The Management Fee and Performance Fee will only be charged at the level of the Master fund in Luxembourg.